Victoria Azarenka proved exactly why she is being touted as a realistic title contender at the Australian Open on Thursday – not that she is buying it. The Belarussian wasted no time in her 6-1 6-2 thrashing of Montenegro’s Danka Kovinic, breaking serve in the first game of the match and racing to a 4-1 lead in no time, before wrapping things up in 65 minutes. Azarenka will play unseeded Japanese teenager Naomi Osaka on Saturday, and while she said she would have to do some study on her opponent between now and then, “staying in the moment” is a priority. 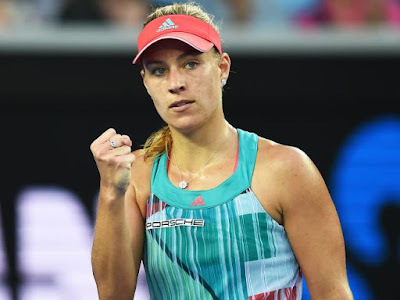 Germany’s Angelique Kerber cruised past Romanian Alexandra Dulgheru 6-2 6-4 and into the round of 32, avoiding becoming the 17th women’s seed to depart the Australian Open. The No.7 seed goes on to play American Madison Brengle in the third round. Third seed Garbine Muguruza, the 2015 Wimbledon finalist moved into the third round for the third straight year at Melbourne Park with a 6-4 6-2 win over Kirsten Flipkens. Muguruza is yet to drop a set in the tournament and next faces world No.48 Barbora Strycova, who beat Vania King 7-6 (5) 6-4. Ana Ivanovic eased into the Australian Open third round, keeping her focus through a 30-minute mid-match delay while medics treated an injured spectator. Despite the mid-match drama Ivanovic, seeded 20, was always comfortable against Latvian qualifier Anastasija Sevastova, cruising to a 6-3 6-3 win on Rod Laver Arena. “This is my favourite court in the world,” said the Serb. Both players had to deal with a first-set delay while ambulance officials treated an elderly spectator who apparently slipped down some stairs inside the stadium. As Ivanovic and Sevastova looked on anxiously, an umpire was heard telling them that medics were waiting for a spinal board and collar before they could move the stricken fan.